Centrally located with a combination of urban, beach and downtown flare, West End is one of the easiest neighbourhoods for visitors to explore, getting a real taste of how real Vancouverites live. Close to downtown business district and easy walk to English Bay and Sunset Beach, you can wonder while surrounded by the diversity of family-oriented and gay-friendly people in an area with selection of great value restaurants offering cuisine from every part of the globe and access to the most amazing ocean-mountain views in the city. One of the stunning high rise concrete building with walking distance to English Bay and Yaletown. Completely renovated in 2013 by Mike Strutt Design ( total value up to $80,000). Partially ocean view of English Bay. Contemporary linear kitchen oak cabinet, corian counter, German made AEG cook top and oven. Miele dishwasher, and hookfan, Blomberg Washer/Dryer. Engineerd Oak floors. Stone mantle fireplace, Spa style bath with large glass walk-in shower. Open House Sat, Sun April 27, 28 2pm - 4pm. Welcome to The Lions Tower! This north west facing 1 bed + solarium offers a flawless floorplan with no wasted space, overlooking beautiful water and North shore Mountains and also partial views of English Bay. 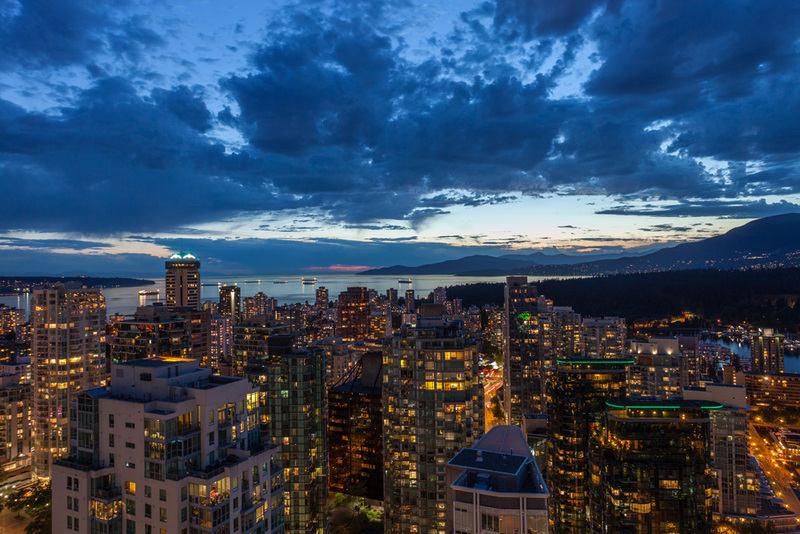 The Lions Towers are perfectly situated, only 3 blocks to the Seawall, yet only 1 block from the world class shops and restaurants of Robson St. Comes with in-suite laundry, parking and storage. Amenities include a well-equipped 3000 sqft fitness center, sauna, guest suites, 24-hour concierge and theatre. Pets and Rentals allowed. Welcome to Qu’appelle. This mid level concrete boutique building boasts 2 suites/floor. The suite has tons of natural light coming in from the N,E & S. Beautiful open kitchen is classic/timeless in design with Caesarstone countertops, stainless steel appliances. Tons of storage for all your beautiful china & crystal. Living room boasts a beautiful gas fireplace. Lovely SE solarium with city view. Master bedroom is spacious and has a walk in closet that leads to a 2 piece bathroom. It includes one of the largest condo underground parking spots you'll ever find in Vancouver. Incredible value in the heart of the West End! Pets welcome, NO rentals. Rarely available 2 Bedroom+den corner unit at the MODERN by Amacon. This gorgeous residence offers an incredible layout, great living & dining space, large Den, flex room, and a wrap-around balcony. High-End concrete apartment featuring floor to ceiling windows, air conditioning, engineered hardwood flooring, custom rollout blinds, “Bosch" cooktop/oven/dishwasher, Fisher Paykel refrigerator. Centrally located. Just steps away Transit, Beaches, Parks, Schools, Shopping and Restaurants. Building includes concierge, fully equipped fitness facility, entertainment lounge & rooftop deck. 1 parking 1 storage included. Listed By: Royal Pacific Lions Gate Realty Ltd.
Fabulous loft style suite with 9 foot ceilings, exposed wooden posts & beams. 2 large bedrooms and 2 bathrooms. In-suite washer and dryer. Large Living room. Rare construction style in the West End with lots of possibilities to upgrade and renovate. Updated roof, balconies, hallways and lobby. Comes with 1 parking and 1 storage locker. Needs some TLC. Totally renovated one bedroom unit in the heart of the West End, steps to everything Denman and Davie has to offer and a quick walk to English Bay & Stanley Park trails. Offering stainless steel appliances, white shaker cabinets, built in eating area, laminate flooring throughout, large bedroom and spacious living room, as well as shared laundry in building with hook up’s available in unit. Abundance of natural light through sliding door that opens to large southern exposed balcony overlooking the beautiful tree lined street. Building has been upgraded, new windows recently. Secure parking and large storage locker, rentals and pets welcome. OPEN Sat Apr 27th & Sun Apr 28th from 2-4pm. Welcome to the emerald, classic luxury as you walk into the dreamy entrance facing a magnificent indoor pool. this bright NE corner unit has been completely renovated and is the perfect space for downsizer's or families looking for in-city living, yet enjoying the quieter side of Downtown. This contemporary design has all the features for modern living and more, easy to show, and a must see! Newly designed kitchen with updated appliances throughout, custom illuminated closets and cabinetry, well-spaced layout created thoughtfully, and large balcony. RARE WEST OF DENMAN STREET PENTHOUSE WITH LARGE VIEW DECKS! Spacious & ultra-bright, with both southerly & northerly exposure. This tastefully updated home offers views of English Bay, Lost Lagoon, Stanley Park, Coal Harbour, Fireworks, city lights, and the North Shore mountains! Features of this unique suite include HW floors, granite counters, SS appliances, electric fireplace, in-suite laundry, 2 large decks, & 2 storage lockers. 2nd bedroom with Murphy bed has custom sliding glass doors & currently used as a large den. Extremely well maintained building: Re-piped ('04), New Elevator ('09), Roof ('14/'16), Exterior paint ('16) and more! A pet-friendly (2!) building set on quiet tree-lined street 1 block to Stanley Park. Walkers Paradise with a score of 94! OPEN SAT APR 20 2-4PM. The Shangri-La is a 5-Star Luxury Living Experience! Located in the heart of Vancouver, this 1,146 sqft 2 bed, 2 bath, boasts westerly views of English Bay and the city skyline. Features include high end finishings, a gourmet kitchen outfitted with Miele appliances, floor-to-ceiling windows, the Market Restaurant, 24 hour concierge, pool, gym, room service and the Chi Spa. This is a great investment opportunity or a fantastic residence to call home. Coal Harbour @ The Residences on Georgia. One BR + office, large and bright windows with a very efficient floor plan. View of English Bay, Coal Harbour, Stanley Park, Robson Street, Urban Fare, Safeway, restaurants, shops, Pacific Centre and both rapid transit lines. All sizes and ages are approx. only. The Buyer should not rely upon the listing information without the Buyer independently verifying the information. Welcome home to this incredible one bedroom suite in one of the BEST locations in Vancouver with partial water views! Flooded with natural light from the oversized windows, this rarely available CORNER unit has the perfect layout! Buy with confidence in this very well maintained CONCRETE building which has new windows and doors, Balcony membrane+guardrail replacement and building enclosure rehab consisting of Concrete repair+painting, just completed! Walking distance to everything! The building also has an onsite caretaker, outdoor pool, roof top deck with incredible views, green space, 1 secured parking and storage locker. Maintenance fee includes taxes, hot water, heat etc. Rentals allowed! Open house Sunday, April 28th 2-4pm. Location, Location, Location! Live walking distance to all major transit, Shopping, Restaurants, YMCA, and more! Alberni St now boasts the most high end stores including Tiffany's, Van Cleef and Arpels, Burberry, Tory Burch and More. Suite has 2 bedrooms (separated), 2 baths and 2 balconies with great floor plan, insuite laundry, laminate floors. Amenities include an indoor swimming pool, hot tub, sauna and exercise room. One Parking included. Call today for a private showing. The design of 1550 Alberni Street is shaped by its environment, by Japanese architect Kengo Kuma, developed by Westbank,The 43-storey tower is carved by two emphatic scoops that form deep balconies furnished in wood. This unit offers 2 bedroom + flex corner unit, complete with its own private inner Japanese garden on balcony, 1 parking space & 1 locker. Amenities include gym, indoor swimming pool, art gallery, wine tasting room and soundproof listening/music room. Under construction. All Measurements are Approximate, Buyer to Verify if it is important. Completion Estimated on 2021/2022. Photos & renderings are from the developers original marketing package and may not represent actual views. Very good managed 1 bedroom and flex room unit in the heart of Vancouver downtown. Move in conditions. Features 24 hours concierge, conference rooms, and fitness center. Walking distance to trendy Robson Street, Coal Harbor, Skytrain Station, Stanley Park, and public transits. 24 HOURS NOTICE FOR SHOWINGS ONLY WEEKDAYS BETWEEN TUESDAY AND THURSDAY FROM 5 PM TO 7 PM. 1706-1005 Beach Ave - THE ALVAR - One of the most sought after locations downtown, concrete construction, beach front living in the West End. This almost 800 sq.ft. 1 bed + den has fabulous views of English Bay, the mountains and west end. Corner unit with wrap around windows, 9' ceilings, hardwood floors, f/p, A/C, fabulous kitchen with stainless appliances, gas cooktop and granite counters. Great open floor plan with no wasted space. Amenities include a lounge, media room, hot tub, gym and visitor parking. Steps to the seawall, aquatic centre and granville island ferry. 1 parking and storage included. Welcome to this rarely available pied-a-terre on a quiet tree-lined street in one of the most sought after areas of the west end community! Well-kept bright studio suite with an efficient layout and 8'8" ceilings. Conveniently located just steps from shopping and dining on Denman and the iconic beach and seawall at English Bay. Proactive strata and extremely well-managed building with many recent upgrades: elevators (2003), plumbing (2008), new roof (2013), lobby update (2013), new windows (2014), new balconies (2018), new hot water boiler (2019). Includes 1 parking & 1 storage. Rentals and pet friendly! Excellent starter home to live your best west end lifestyle. OPEN HOUSE SUNDAY APRIL 21, 2-4 PM . A gem located in the downtown area of Robson St. and close to all shops, cafes and fine dining, transportation. The 777 Burrard is a unique building that was upgraded in the early 1980's. Perfect home for single or couple seeking convenience to all amenities. Watch for additional details coming soon! By appointment only please.